From the title alone, you know where I’m going with this, right? Mostly I’m hoping you’ll click over to read my latest Funny Names in Food post as it was heaps of fun to research and write as well as being about one of my favorite subjects. Please hop over (like a Peeps® bunny 🙂 ), then come back for today’s recipe. Some folks are smart enough to toss or give away the obscene amounts of Easter candy collected by their children from that Bunny. Not only am I not that smart, but I make it even worse by succumbing to 75%-off after-holiday candy bargains. Though it’s fun to have sweet treats around, it’s also dangerous. I vowed, then, to use a bunch of it up in rice krispy bars I was making to take to a dessert potluck. While the end product was overly sweet (something you won’t hear me saying often), that can be remedied by using a more judicious selection and amount of candy stir-ins. 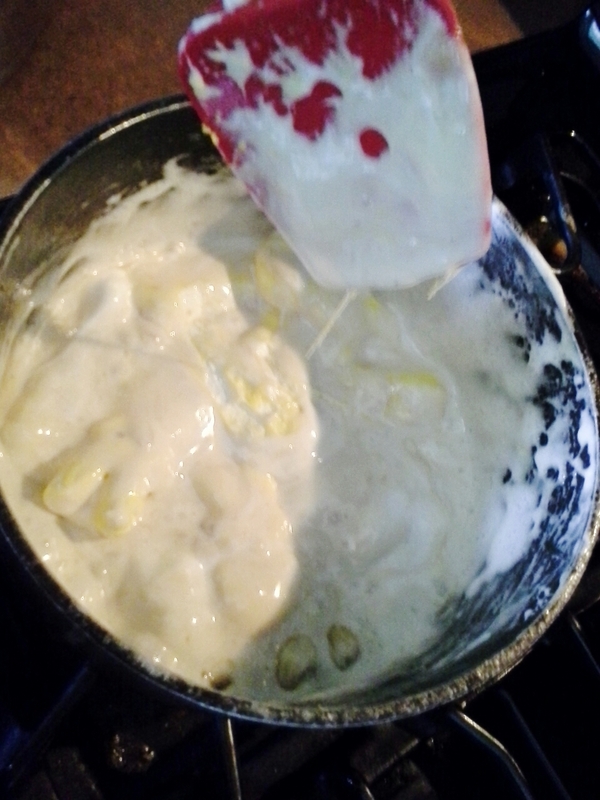 Peeps being stirred into the marshmallow-butter mixture. Though I used the word “recipe” earlier, I’ll cop to not having one. I melted a bag and a quarter or so of standard-size ‘mallows and 3 or so tablespoons butter. Then stirred in the yellow peeps. Maybe 3/4 cup or so of chopped jelly beans? And 4 cups of krispy rice cereal? Or so? It was plenty wet and sticky, so could’ve stood another cup of the cereal. In the end, details don’t matter so much. It’s about thinking outside of the candy box and stirring those extra sweets into cookie dough, cake/muffin/quickbread batter, scone mix, ice cream, pudding, etc. The individual candies could also be laid in cupcake batter before baking for hidden treats. Ha! This is great. I took a look at you Funny Names in Food post too. We were on our way to trying the peep in the microwave then my son “remembered” eating the last of the Easter peeps, “how could I forget I ate them” he asks. Ha! Peeps do that to you. They take your mind away temporarily. I really like this Liz. Peeps are fun. Weird because I really don’t like to eat them at all! 🙂 They are so festive and bring happiness! Agree on the happiness! I’m sure that’s why they draw me in. Though I like how they’re sweet and also the texture contrast with the crunchy sugar. 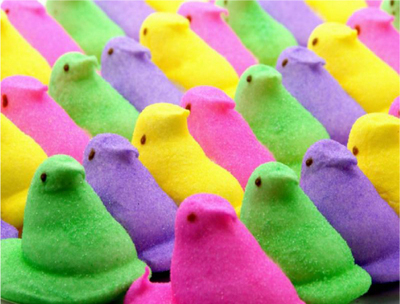 Normally, I’d be aghast at so much food coloring, but for whatever reason, it’s ok with the Peeps. Must be a childhood memory thing. Appreciate you coming over very much. And your son can surely find Peeps on a clearance shelf somewhere. If no, July 4th Peeps will be here shortly haha. And thanks for checking out BoFN. Blew my mind–27 hours! I did see them on clearance at the grocery store today! But I didn’t even consider buying any because Gramma sent him 3 double packages of them for Easter! And apparently he finished them all off. Fourth of July peeps? Hahaha. What are they….stars? American flags! Oh, I do love Rice Krispie Bars, and the more ingredients, the better. My husband is salivating. I have a really big box of rice krispies and wish I could send you some. And also some of my jelly beans. Will work on that blogging portal. I didn’t buy myself (under the pretense of bringing it in for my co-workers) any Easter candy this year and as soon as it went on clearance I looked for my beloved Robins Eggs. Nowhere to be found! Lots of Peeps though! 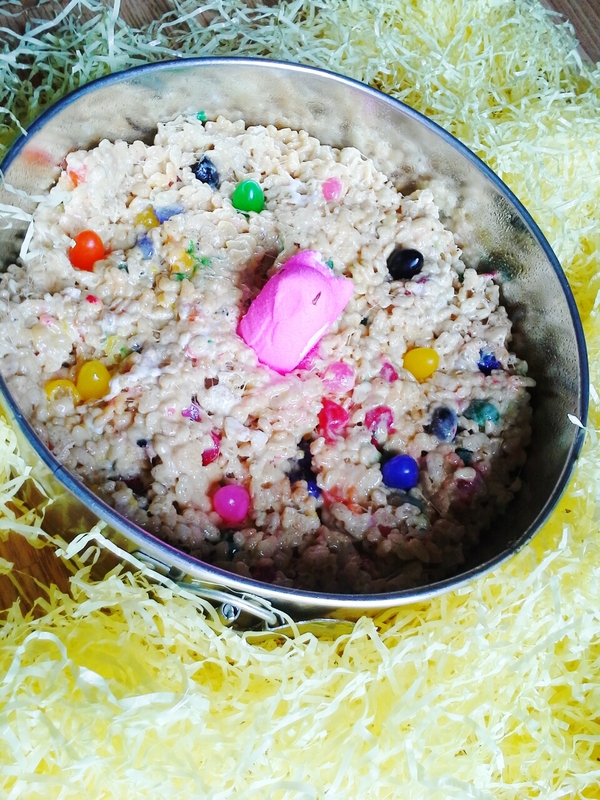 Despite the sugar-on-sugar extravaganza I like the idea of jelly beans in Krispie treats. Colorful! I bought our local grocer out of mini cartons of those robin’s eggs at 25-cents a pop! But gave them all away at party favors at my daughter’s bday party. Overall, the rice krispy bars were prettier than they were tasty. Needed more cereal or even a sprinkle of sea salt. Next year for your Robin’s Eggs! Love the idea of the jelly beans as well. yes exactly–for the advancement of food science. Nice spin! Did the Easter bunny bring Fannie anything? Haha, you are funny! Kale smoothies. I think I would have to lie down after eating those bars as well. Though I have to admit, they look and sound pretty tasty! Peeps are delicious. I tried a kale smoothie once and couldn’t get it down–bleagh. But surely there’s something delicious and healthy and green that would help reverse the effects of all the sugar I eat. ?? Thanks for coming over for the party. Hope you got to see the funny blogs post as well as that really was a party. It gets crazy over there! Wow, my kids would be all over these! Definitely too sweet for me though. I will admit I don’t even care for jelly beans or Peeps. Our poor kids were “deprived” as they only got two Reese’s PB eggs, one York peppermint patty egg and a handful of coconut m&m’s and robin’s eggs. We are in detox mode….so sick of all the candy we can never seem to get rid of. First Halloween, then Christmas, Valentine’s Day, Easter…birthday and school parties… I threw it all out after Ewan just had his first cavity! Besides to me it is nearly all empty sugar calories unless it is CHOCOLATE! I, too, find it obscene all of the candy collected during these holidays. I need to be stronger and just throw it out. We just picked two more gallons of strawberries today! We are candy free, I think. One never knows what may be hidden in my messy pantry! 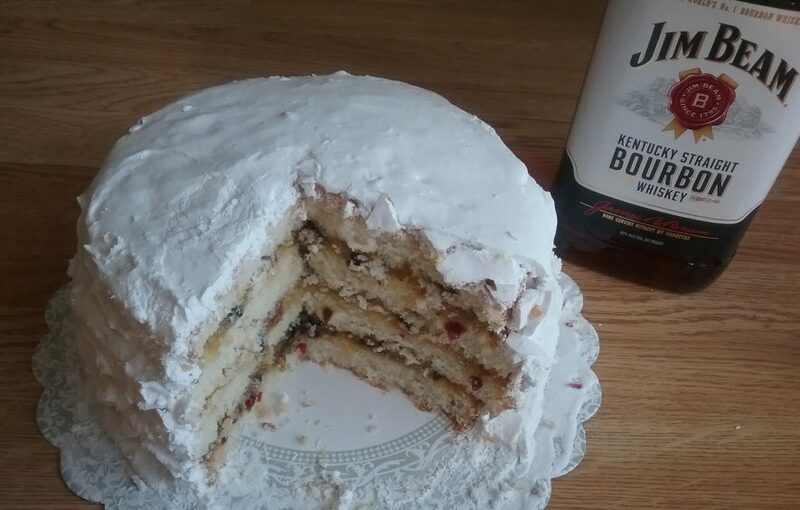 I am still all for homemade desserts now an then, just so over candy. I didn’t know such a thing as peeps existed until sometime before Easter – I was all like “peeps what?? are they like…little people?” 🙂 I can’t believe it took 27 hours to make and decorate peeps by hand, and they still made money doing that? Can’t imagine anyone having a peeps eating competition in those days, if that was going to be a few months of someone’s peeps-making labour, gone in 20 minutes? Your rice krispy bars look completely over the top, and it has to be the most colourful rice krispies – I love it!! lol, so glad you’re finally in the Peep know 😀 They’re iconic for sure. All about sugar. One Peep in just over a full day does seem a bit inefficient. Glad Bob Born figured out how to make it happen more quickly. Money to be made. Thanks, Chef Amy 😀 I did not know there were flavored peeps out there and am not sure I approve 😉 The whole point is that these are unapologetically sugar sugar and more sugar. If they go balance that sugar out with an actual flavor… Would have to try before I say any more. But just seems wrong haha. Glad you came over. Will be keeping my eyes out for these sour watermelon etc peeps. Have you tried? Why does each recipe seem more yummy than the one before it? How do you do that!!! you are being too kind, mimi. It’s all about the sugar. Thanks, Andi. 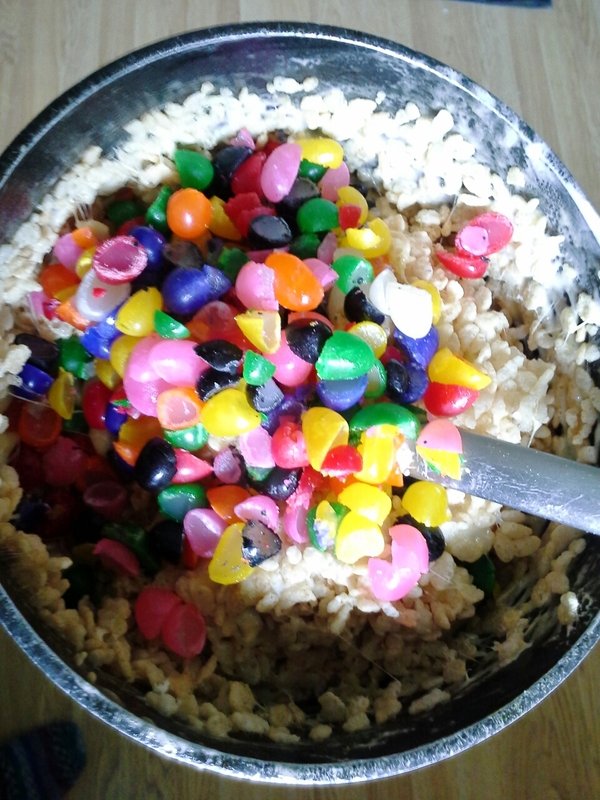 I think m&ms would have made a better stir-in than the j beans–a bit less sweet. Though a sprinkle of coarse salt would have helped, too. You are not a Peep lover, you say? It takes all kinds. Talk about decadent. Why choose one candy when you can combine them all. I love peeps. They’re so cute! Though I suspect you know how to make your own. lol, yes–why choose just one. Excellent Q! I’ll get you my little pretty 🙂 And then we’ll go out for cocktails! If only I could take a bite of those colorful krispy bars. I love how you’re always thinking outside the (candy) box! I don’t have any specific kale smoothie recipes, but I often juice kale, celery, carrots, apples, and ginger together–it actually tastes quite good! about how much of each ingredients in the smoothie? I tried one once with ginger, kale, green apple, spinach, celery, and lemon and could barely choke it down. Really want to like something so healthy. Honestly, I never measure/count how much of each ingredient I use…so sometimes the juice comes out great and other times it’s just okay lol! I would suggest starting off with more celery to water it down and also more apples to sweeten it..maybe use red apples next time or leave out the lemon? Let me know how it goes! Absolutely – I couldn’t agree more. I’ll look out for Peeps next time I’m in the US, towards the end of May. I guess that I can get them in a supermarket? Oh my! Well, why not??! What fun! I too am one of those people that would buy the reduced price candy – then regret eating it all! alas, that’s why we need to keep eating asparagus, too Jayne 🙂 Thanks for your fun comments. Love it when you come over. Omg, yes, I’m looking at that and thinking about the gooey sugar rush. And it looks like one big sticky mess. It has been ages since I last had a jelly bean. Your rice krispy bars sound and look awesome! Thanks, Angie 🙂 I think it will be ages before I have another jelly bean–OD’d this year. Appreciate you being here very much! You’re smart to have forgot! Now have started taking the extra candy into work. Thanks for coming on over and your kind words. Ooh, what a great way to use up the Peeps! I never tasted a jelly bean before so I don’t know what it tastes like??? Looks very interesting though! seems neither Peeps nor jelly beans are universal. If you want to imagine what a jelly bean tastes like, think sweet and chewy with an artificial fruit flavor. A few at a time are good, but too many make the teeth hurt. LANGUAGE BARRIER ALERT: I had never heard of a Peeps bunny. Now I have. And I am immediately furious that they are not sold in England. I WANT TO MAKE THESE RICE KRISPY BARS, THEY MAKE ME HAPPY. no Peeps in England? Sacré bleu. I think you would like. Though if the picture makes you happy, I suggest you save it to your desktop or print and post on your wall. If you actually had these at your disposal, you might do as I did and eat too many, then regret which did not make me happy. 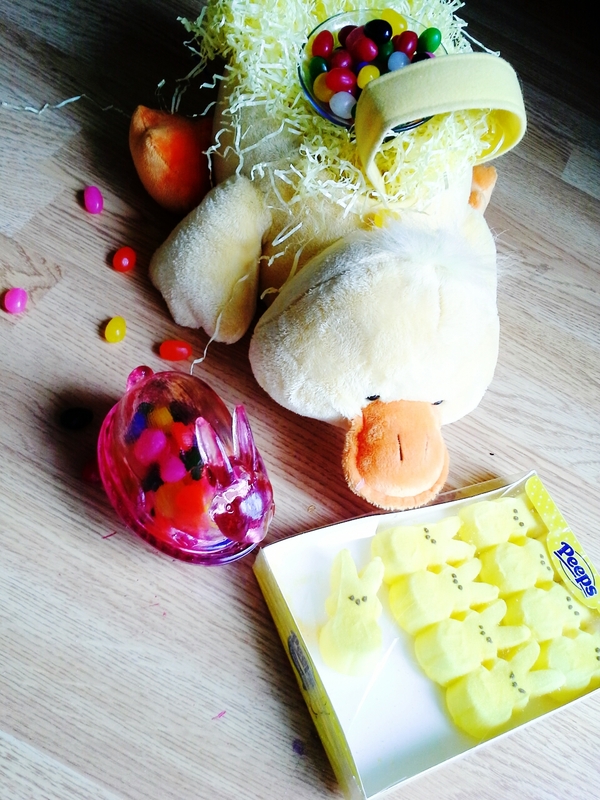 Maybe better just to look at the cute chick basket and jelly beans and Peeps. Here’s a thought: Perhaps Stick and a Peep would be very good friends if they met? Wow, Liz! These look like SUPER sweet treats- I bet your kids loved these! LOVE this post, rice krispy bars are also my ultimate favourite treat! Thanks, CCU 🙂 Love that you love rice krispy bars. They’re so simple and good. Glad you have your study motivation box at hand. Perfect!